Fact-checking has come a long way in the Internet age, evolving to a point beyond recognition. In the good old days, fact-checking was a venerable profession with its set of ethical rules, and fact-checkers were an integral part of any self-respecting publication. They had helped the media outlets avoid lawsuits and maintain their credibility, and had also made the lives of people like Stephen Glass hell. In checking long, reported articles, checkers sometimes made dozens of phone calls a week — to bartenders about a restaurant’s ambience, to E.M.T.’s about how stretchers are handled or to anti-abortion activists about the dimensions of ultrasound images on their placards. Not infrequently, checkers were in the diplomacy business, and the best checkers were known for their bedside manners with sources, reporters and editors. Good checkers did not play gotcha, did not gossip about which reporters were error-prone and stayed true to the goals of journalism — to be newsworthy and interesting — as well as to our sub-sublibrarian dedication to factuality. In time, those — as well as the microfilm — were trumped by the LexisNexis’ searchable archive of periodicals. The New Yorker apparently had a subscription. With the onset of Google’s and Wikipedia’s popularity, fact-checking was no longer confined to the offices of the established publications. Anyone can “fact-check” with a click of a mouse — anywhere, on any subject. Not that this is necessarily a good thing. Due to perpetual staff cuts and the ever-present race to be first with a story, it appears that the ‘who, what, where, when and why’ tenets of traditional journalism have been replaced with, ‘Just get something posted online now.’ This apparently leaves the burden of fact-checking and actual reporting to readers and good Samaritans in the comments section. So if journalists do not have the time or resources to verify a story and we as readers have no duty to keep the playing field neutral, what happens next? At what point are ‘traditional’ online news outlets on par with ad-heavy opinion blogs? What do media companies need to do in order to maintain any sort of respect or readership? Is respectful reporting of news even necessary in order to grow readership or does it in fact hinder it? In addition to the ethical questions, Wise also failed to correctly calculate Twitter’s growing influence as a news source. If he looks upon Twitter as a playground or lab experiment, he should know that 190 million people visit the site every month. Many use it as a news aggregation service and early-warning system. Hot stories spread fast via the service. It has become a simple and efficient way to interact with multiple media sources, pundits, and any Joe who proves trustworthy and knowledgeable. If Wise was trying to prove that information on Twitter was somehow of lesser value than stories from traditional news sources, he helped prove the opposite. 1. Ask for their sources. 2. Use original sources (independent and non-partisan in particular). — Where did they find that? — That’s a user-generated site! That could have been written by a seven-year-old! In short, fact-checking has assumed radically new forms in the past 15 years. Only fact-checkers from legacy media probably miss the quaint old procedures. But if the Web has changed what qualifies as fact-checking, has it also changed what qualifies as a fact? I suspect that facts on the Web are now more rhetorical devices than identifiable objects. But I can’t verify that. 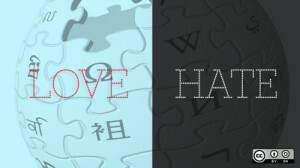 Image of Wikipedia logo by opensourceway, used under its Creative Commons license. The SAI chart image is used under Fair Use: Reporting.